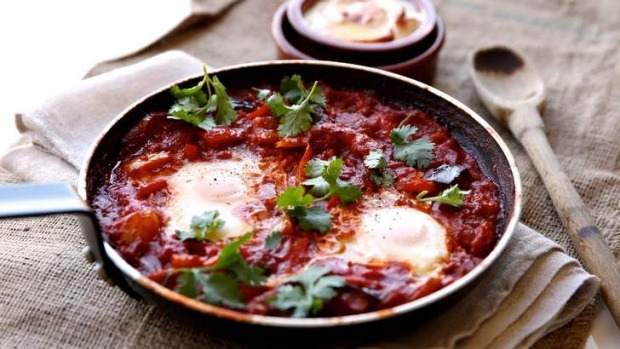 A dish of eggs poached or baked in a spicy tomato sauce, popular across North Africa and the Middle East. Also known as chakchouka, it's popping up on more and more all-day breakfast menus, served with sourdough toast or warm Turkish or pita bread. Shakshuka's spiritual home in Sydney is Shenkin, a funky little cafe in Erskineville, where the Haikin family bake their own pita bread to accompany bubbling earthenware pots of rich, spicy capsicum, garlic and onions. There are riffs on the menu, including a Mexican one with beans and corn, and another with eggplant and haloumi. "Shakshuka is fun, it's a mess in pan" says Din Haikin. "You shovel things in there, and they come out tasting amazing". At new Darlo hotspot The Royal, a girl in a vintage Snoopy skirt ferries bowls of shakshuka, bee pollen smoothies and old-school pikelets to the streetside tables. Chef Chris Bull says the tiny kitchen sends out up to fifty pans of shakshuka a day on weekends. Israeli-born chef Michael Rantissi puts his heritage to excellent use on a menu of some of the most moreish food we've seen in a month of Sundays at Kepos Street Kitchen. "Israel is as multicultural as Australia," he says, "so things like shakshuka and falafel are very popular here." His mum's recipe for shakshuka includes tomato, capsicum, paprika, cumin, coriander and plenty of black pepper. His tip? "Undercook the eggs a little, as they keep cooking in the pan on the way to the table". At Spout cafe in Ripponlea, the shakshuka with green olives, preserved lemon and haloumi fits right in among the lamb shawarma and Moroccan chicken schnitzel sandwiches on the all-day menu. Chef Ferris Zul Khamsani uses red, yellow and green capsicums ("each one has a different flavour") and says the tomatoes should be over-ripe. "Then you need no sugar, and it is healthier," he says. Fitzroy's Birdman Eating is also getting a name for its baked eggs, perhaps because there's an option to add a Bloody Mary to the order, or because the kitchen changes the dish every couple of days. "It could be with eggplant and creamy yoghurt," says manager Sarah Loukes. "Right now, it's either braised beef and haricot beans or ratatouille." At South Melbourne's Stove Monkey, the baked eggs and chorizo come with fresh tomato and feta salsa, topped with sweet potato crisps. Co-owner Jamie Beulke says the eggs are cooked in a hot oven for 10 minutes. "People shouldn't be scared of cooking eggs this way," he says. "Just make sure your base sauce is hot before you crack the eggs over thetop." Because it's the perfect brunch, lunch or fast mid-week dinner at home, too. All you need to do is workshop the right pan, the right heat and the right timing, so that you end up with a spicy, thick stew and eggs with set whites and runny yolks. Shake it up by adding feta, haloumi, chorizo or yoghurt. Birdman Eating 238 Gertrude Street, Fitzroy (03) 9416 4747. Spout 48 Glen Eira Road, Ripponlea, (03) 9523 8155. Stove Monkey 191 Clarendon Street, South Melbourne, (03) 9090 7844. Cook the base stew in advance, then you can divide it among small heatproof pans before adding the eggs. The number of eggs depends on the size of the pan. 1. Heat the oil in a medium frying pan, and cook the capsicums and eggplant for 10 minutes over medium heat, tossing well, until softened. Add tomatoes, tomato paste, harissa, cumin, paprika, sugar, sea salt and pepper and 150 millilitres water and simmer for 10 to 15 minutes until thick and saucy. Make four hollows in the top, slip in the eggs, cover and simmer for 5 to 10 minutes or until cooked. Scatter with coriander and serve with yoghurt. TRENDING Kale chips are the new potato chips. Tear kale leaves into bite-sized pieces, toss in a little olive oil, sea salt and pepper and bake at 160C for 5 minutes or until crisp. Great with a glass of wine.